If you want to win more matches, you need match strategies. Discover how to plan your strategies here. Previously we looked at developing a match strategy - a plan of action which sets out how you intend to beat your opponent. We saw that you first need to be able to play all the basic strokes and that you then need to analyse your opponent's playing style. So how do you analyse your opponent's playing style? Well the best way to analyse your opponent's playing style and their strengths and weaknesses, is to watch them play several times. However, that is not always possible if, for example, you're playing in a competition or playing at a different table tennis club. In those situations you'll need to use the warm up period and the start of the match in order to analyse your opponent's playing style and develop your match strategies. So before you can develop any match strategies you first need to decide what style of play your opponent predominantly uses, and then understand the strengths and weaknesses of each playing style. An attacker will generally try to play strong attacking strokes (loops and drives) on both the forehand and the backhand side. Watch a demonstration of the forehand loop and backhand loop here. Watch a demonstration of the forehand drive and backhand drive here. They will usually be able to do this successfully if their opponent plays the ball long (close to the end line of the table), or if their opponent plays the ball higher over the net. By using loop and drive strokes their opponent will have less time to react because the ball will be travelling fast, and their objective is to win the point as quickly as possible. Therefore to counteract this style of play you need to keep the ball low over the net and keep it short, that is, make sure that it would bounce at least twice on your opponent's side of the table tennis table if they failed to hit it after the first bounce. However, if you play the ball long, you need to put them under time pressure. This means that you need to play faster in order to make them play their next stroke before they've had sufficient time to recover from playing their previous stroke and make them move quickly to get into position. A defender will generally try to play backspin strokes on both the forehand and the backhand side and rely on a good rhythm by playing at a speed which suits them. They will also try to make their opponent play at this speed. They will usually be able to do this successfully if their opponent plays the ball long, that is, close to the end line of the table, and/or if their opponent plays the ball at a fast pace. However, they can also play backspin strokes over the table and a good defender will also be able to vary the amount of backspin they impart onto the ball. Therefore to counteract this style of play you need to vary your strokes and ensure that the defender cannot get into a predictable rhythm. You can do this by good placement of the ball. For example, by playing the ball short over the net then and playing your next shot long (close to the end line), you can make the defender move in and out. However, you must ensure that you do not play a predictable pattern. For example, do not play one short ball followed by one long ball followed by one short ball. Mix them up and keep the defender guessing so that they won't know what's coming next. Also you need to vary the speed and spin of your strokes. A counter-hitter / blocker will generally try to play close to the table and use the speed of their opponent's topspin strokes to play a fast counter-hit stroke or block in order to put their opponent under time pressure. 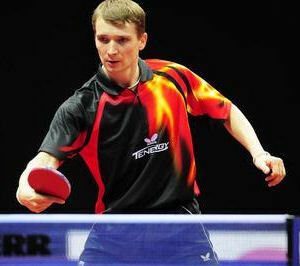 They will hit the ball very soon after it bounces and make use of angles to manoeuvre their opponent around the table. They will usually be able to do this successfully if their opponent plays the ball with topspin or no spin, and with speed. Therefore to counteract this style of play you need to vary the speed and spin on the ball and also use backspin whenever possible. You also need to vary the placement of your strokes. An all-rounder will generally play a mixture of strokes. They will attack, defend, counter-hit and block in order to keep the ball in play and frustrate their opponent. They generally have good ball control and are able to adapt to different styles of play. Therefore to counteract this style of play you need to work out which are their weaker areas and play to these. So for example, they may be better at defending than attacking or vice versa. So if they are better at defending, don't play fast long shots which they can chop and vice versa. So once you have determined what style of play your opponent predominantly uses, you can move on to the next phase. So let's take a look at the next element of developing your match strategies...basic tactics.